I’m excited to announce that it’s release day yet again! We have a great new update for you with PowerCLI 6.5.3! Just a few short months ago, two to be exact, the last version of PowerCLI was released. That release introduced a new parameter, some new content library functionality for ISOs, and even new support for certain features. PowerCLI 6.5.3 introduces a brand-new module in order to manage VMware NSX-T environments. NSX-T was announced this year at VMworld US. In a nutshell, NSX-T is the newest iteration of VMware’s multi-hypervisor NSX platform. It is also the key to multi-cloud, and container infrastructures! For more information on the NSX-T RESTful API, the API documentation can be viewed on the VMware Code API Explorer. This release of PowerCLI also contains some usage improvements to a handful of cmdlets. Set-VMHostNetworkAdapter: When configuring an ESXi host’s virtual NIC to use an IPv6 address which is managed through a vCenter Server of version 6.5, the AutomaticIPv6 property has been corrected to no longer flip the switch to ‘True’. We are continuing our commitment to getting the latest and greatest functionalities, performance improvements, and issue resolutions with this latest release of PowerCLI 6.5.3. After only 2 months, we have released a new module to manage NSX-T environments, added a new ‘Create’ method for use with the Get-CisService and Get-NsxtService cmdlets, and fixed a handful of issues with existing cmdlets. For more information on changes made in VMware PowerCLI 6.5.3, including improvements, security enhancements, and deprecated features, see the VMware PowerCLI Change Log. 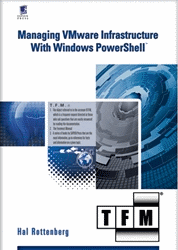 For more information on specific product features, see the VMware PowerCLI 6.5.3 User’s Guide. For more information on specific cmdlets, see the VMware PowerCLI 6.5.3 Cmdlet Reference. This entry was posted in General and tagged PowerCLI on October 10, 2017 by Kyle Ruddy.